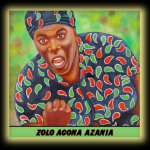 This week on The Final Straw radio we are sharing a chat that Bursts had with Zolo Agona Azania. Zolo is from Gary, Indiana where he lives now, working a job and also doing re-entry work with the formerly incarcerated and community service to break cycles of trauma. After 7 and a half years in prison from ages 18-25 where Zolo engaged in political education with members of the Black Panther Party from Indianapolis, he was released. In 1981 he was re-arrested, picked up by the Gary police while walking around the city after a bank robbery took place, resulting in the death of a Gary police lieutenant. Because of his political views and circumstantially being on the street at that time, Zolo was convicted by an all white jury and sentenced to death. Zolo beat that death penalty from within prison twice and blocked a third attempt by the state to impose it. For the hour, Zolo talks about his life, his parents, his art, his education, his time behind bars, his political development, the Republic of New Africa, and his legal struggle. To see more of Zolo’s art you can visit this support page! This week William speaks with V, who is an anarchist living in Bloomington IN about current and former instances of racist and institutional violence against inmates at the Pendleton Correctional Institution in Madison County, Indiana. Folks are organizing a call in day from 11am-1pm EST on Monday, September 8th. People are asked to flood the central office and the mail room to protest repression against radical and New Afrikan organizing in the form of severe restrictions to mail and communication, among many other things. (317) 233-6984 for the DOC central office. 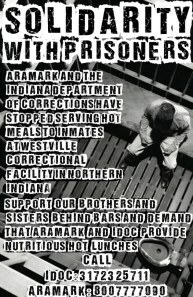 Hunger strike at Westville in IN, Sean Swain radio and more! Also, we announce that we’re now available at 106.5LPFM in Olympia Washington on KOWA. Tune in on Saturday nights at 9pm to hear us!